Around Memphis, Mississippi River May Stay Above Flood Level Into June : The Two-Way Flooding along the Mississippi and its tributaries is breaking high-water records that have stood since the 1930s. 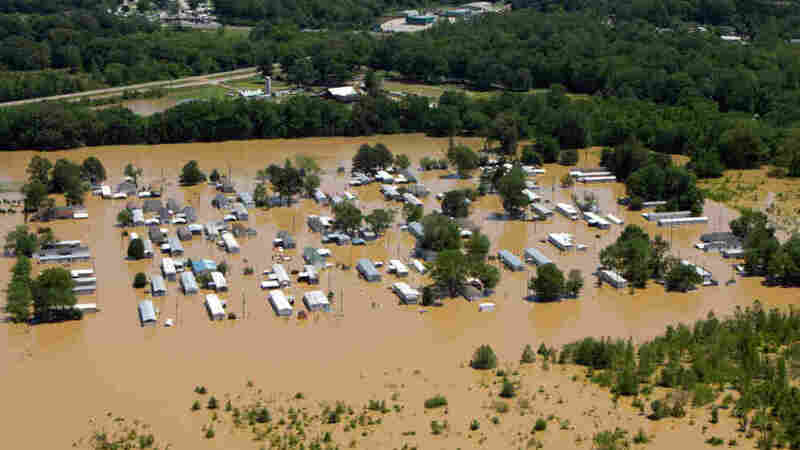 Mobile homes overflowed by floodwaters along the Wolf River in Memphis, Tenn., earlier this week. While the Mississippi River is expected to crest near Memphis by the middle of next week, officials there are warning "that water could remain above flood level through the first of June," local WMC-TV reports. The Commercial Appeal writes this morning that "despite all efforts to hold it back, the Mississippi River burst through a temporary levee and submerged a Downtown-area airport Thursday before spilling onto Memphis' doorstep at Riverside and Beale." And as The Associated Press adds, "parts of the Mississippi Delta are beginning to flood, sending white-tail deer and wild pigs swimming to dry land, submerging yacht clubs and closing casino boats, and compelling residents to flee from their homes. ... To points much farther north, thousands face the decision of whether to stay or go as high water kept on rolling down the Mississippi and its tributaries, threatening to soak communities over the next week or two. 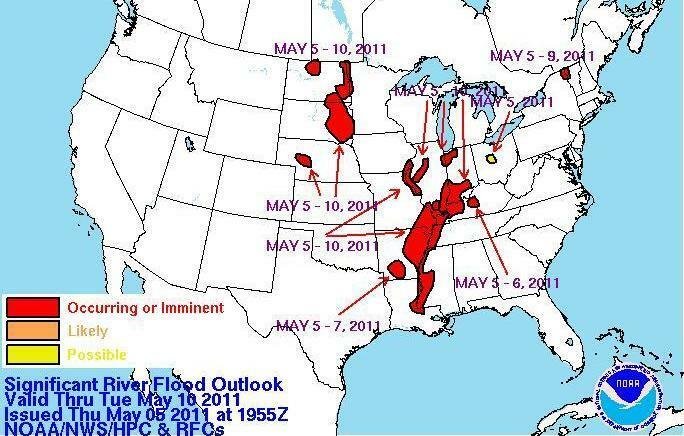 The flooding is already breaking high-water records that have stood since the 1930s." This National Weather Service map makes clear just where the flooding is already happening — or soon will be. Areas in read are already flooded or will be soon, forecasters say. The AP reports that the Coast Guard has closed a five-mile stretch of the Mississippi River at Caruthersville, Mo. The stretch is expected to stay closed to barges for the next eight days, because the Coast Guard fears ship wakes could push water over the floodwall protecting the city. The Associated Press writes that "police officers are going door to door urging Memphis residents to leave nearly 1,000 homes expected to be inundated by a near-record flood of the Mississippi River and its tributaries. Emergency workers handed out bright yellow fliers Friday in English and Spanish that read, "Evacuate!!! Your property is in danger right now."